Hello! I hope that everyone is having a great week so far. Amy created this fun card using our Oh What Fun clear stamps and dies, Double Pierced Rectangle Dies and Peace Love & Joy dies. I love how Santa looks popping up out of the chimney trying to catch snow flakes. It is SO cute!! 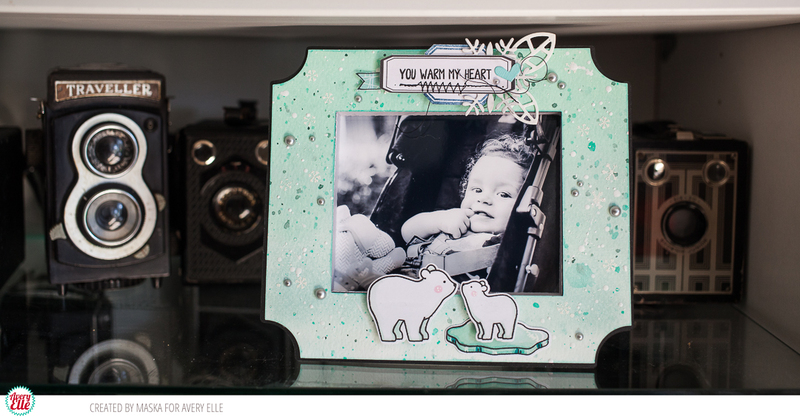 Maska used our Polar Pals clear stamps and dies to create this adorable picture frame. Maska shows how you can use your stamps and dies to create inexpensive and customized home decor projects too. I love how cute this is!! Hello! I have some terrific cards to share today. 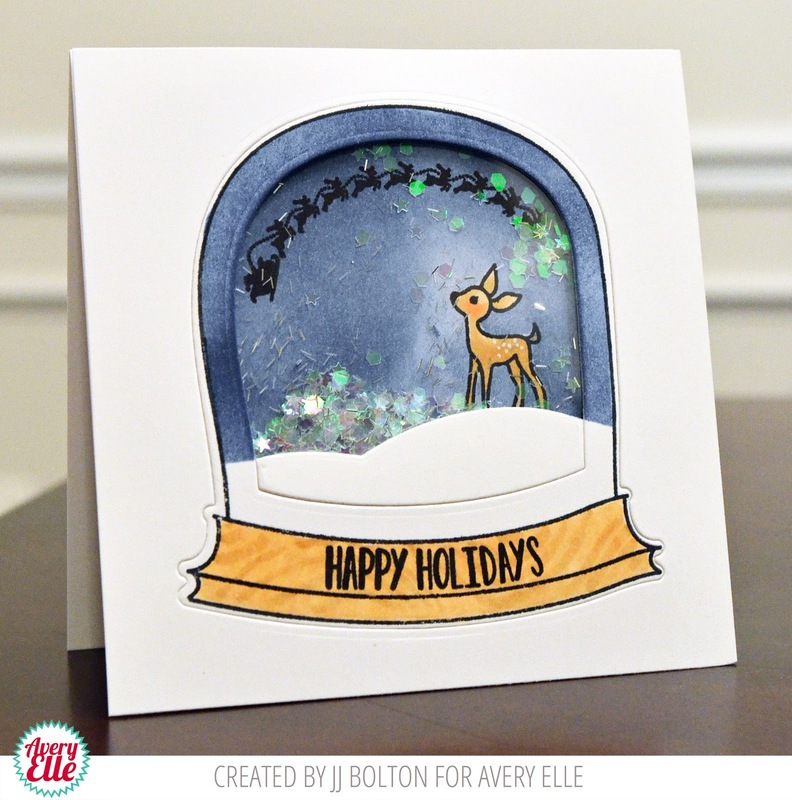 Melania created this adorable snow globe by combining some of our stamp sets. I love how cute the snowman and little girl look together! The gold embossed snow globe is a great detail as well! Melania created a tag using the same Snow Globe stamps and dies below. I love how the die gives the option to easily create a solid tag, shaker tag or just cut out the stamped images. It is so versatile. 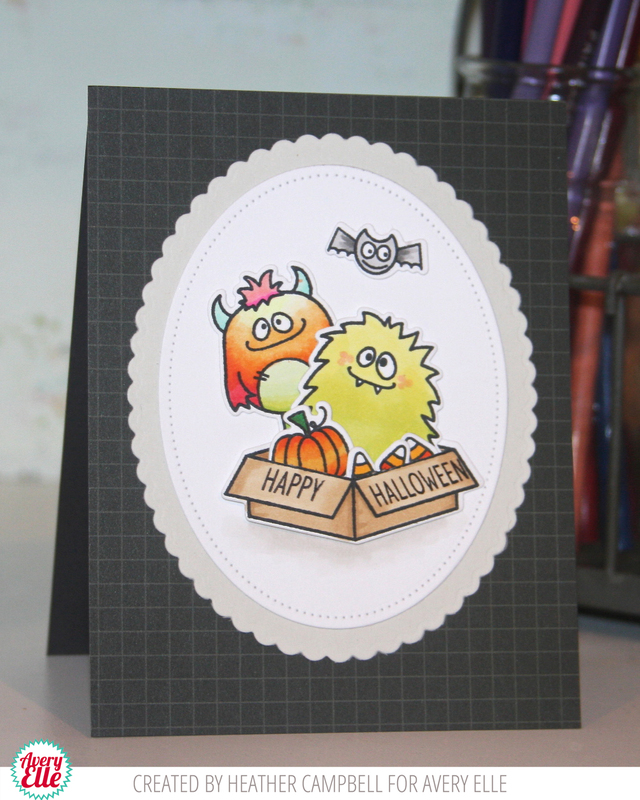 Heather used our Monsters clear stamps and dies to create these next two fun cards. She shows how this set can be used for more than just Halloween! I love that! Thanks Heather and Melania for sharing today. Thank YOU for stopping by to take a peek. Have a great day! Hello! Check out what Caryn and Yainea have to share with us today! 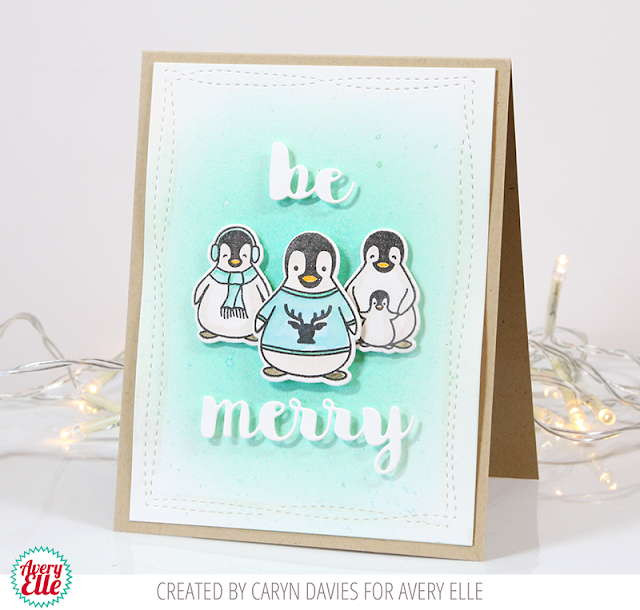 Caryn used our Penguin Greetings clear stamps and dies along with our Wonky Stitches and Holly Jolly Dies to create this first card. I love how she highlighted the cute penguins by shading behind the them. So cute! 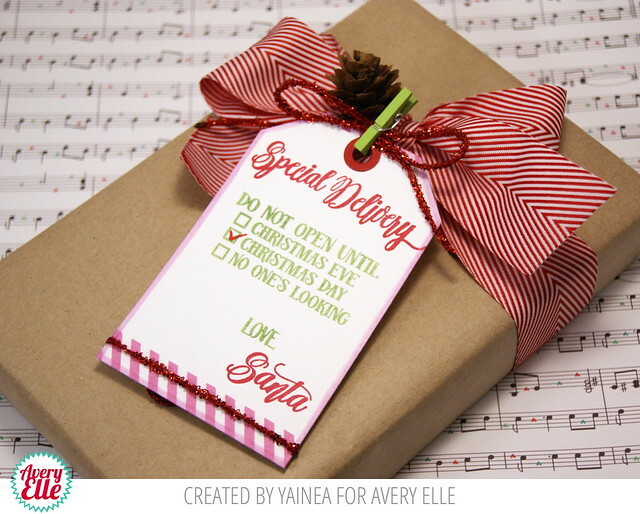 Check out this gorgeous tag and package that Santa left! I love that Yainea took a picture of it so that she could share it with us! Thanks so much Caryn and Yainea! Thank YOU for stopping by to take a peek. Have a great day! Happy Friday! I have three CUTE cards to share today. 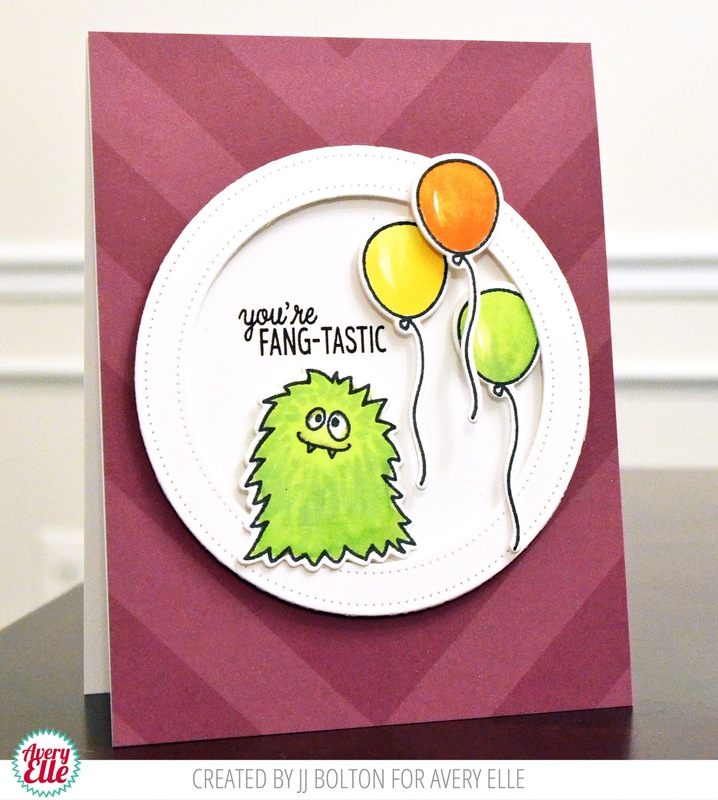 Karolyn used our Oh What Fun clear stamps and dies, Burst Elle-Ments dies, and our Build A Banner clear stamps and dies to create this first card. I love how Karolyn framed Santa. He is so cute catching those snowflakes! Karolyn created this Snow Globe Shaker Card using our Snow Globe stamps and dies and Season's Greetings dies. 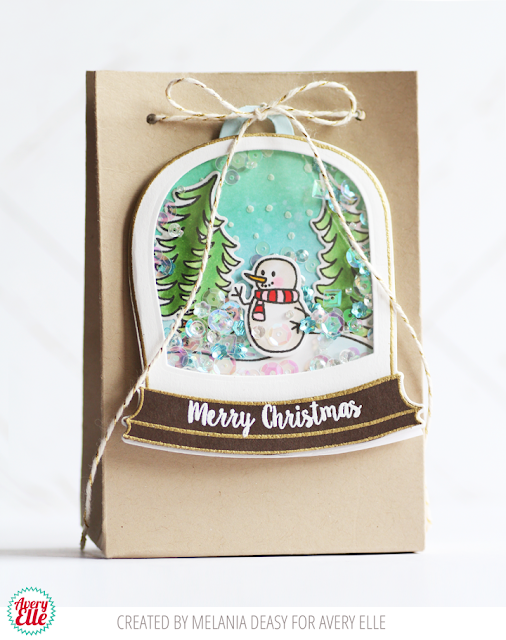 I love how fun the large snowflake sequins look with the cute snowman inside the globe! 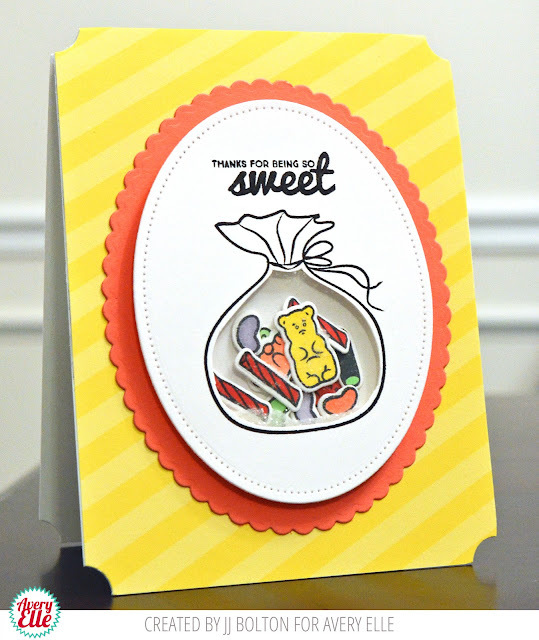 Katie used our Stockings stamp set and Sweet Scallops dies to create this next card. Katie stamped the stocking image repeatedly. I love how the bright stockings look strung across the card! Hello! I have two festive holiday cards for you today. Heather used our Dashing clear stamps and Finished Frames dies to create this first card. I love the little white gel pen highlights on the car. It is a great was to add a little character and customize a stamped image. This is such a cute, clean and simple card! JJ used our Snow Globe stamps and dies and Joy to the World clear stamps on this next card. I love that the deer is looking up at Santa and his reindeer. What a clever shaker card! Fabulous Projects by Amy & Maska! Happy Wednesday! I hope that everyone is having a great week so far! I have two pretty projects to share with you today. 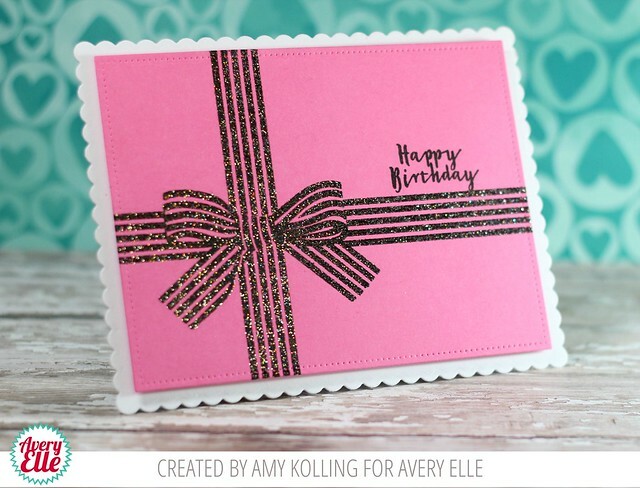 Amy used our Beautiful Bow clear stamps, Sweet Scallops Elle-ments, and Double Pierced Rectangles Dies to create this first card. Check out that black glitter embossing! I love how it pops against the pink. What a perfectly girly birthday card. I love it!! 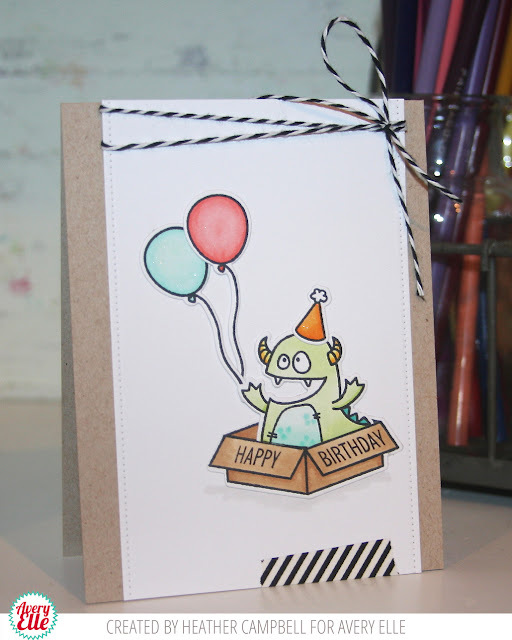 Maska used our Monsters clear stamps and dies to create this CUTE layout! I love her idea of using them for a little boy page! They are just adorable framing the photo and title. Hello! Check out this fun birthday card that Melania created. I just love how cute the monsters look dressed up in their party gear. Someone is going to LOVE getting this on their birthday! Hello! Caryn and Yainea have some gorgeous cards to share with us today! Caryn used our Christmas Florals clear stamps and dies along with our Scalloped Frames dies to create this first card. I love how pretty the large poinsettias look against the black scalloped frame!! 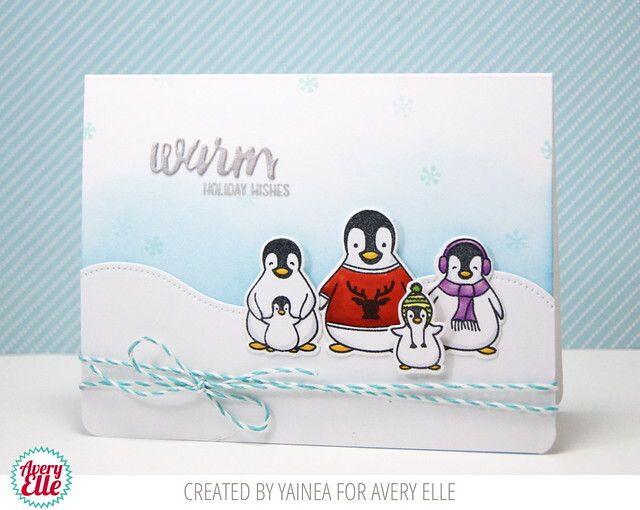 Yainea used our Penguin Greetings clear stamps and dies along with our Dotted Borders dies to create this next card. I just love how all the penguins look standing together with their cute winter gear on! Happy Friday! 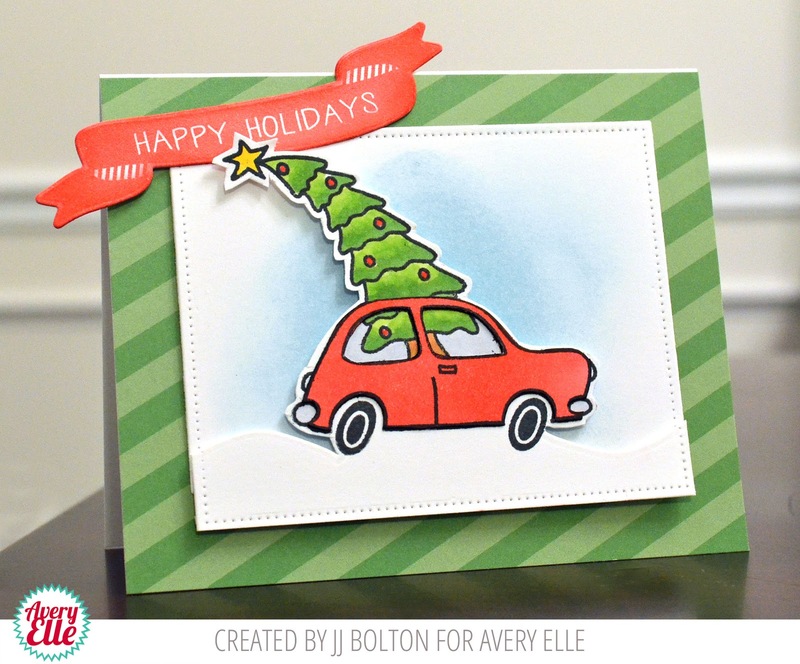 I have a card and a cute holiday tag to share with you today. 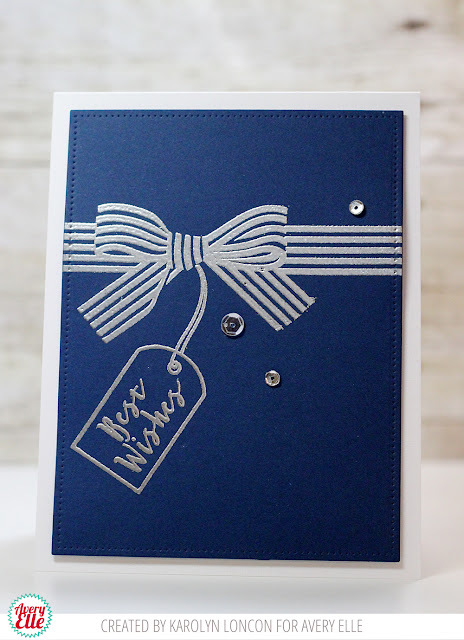 Karolyn used our Beautiful Bow clear stamps and Doubled Pierced Rectangle dies to create this first card. I love how the silver embossing pops off of the dark blue card stock. It is clean, simple and just so pretty! 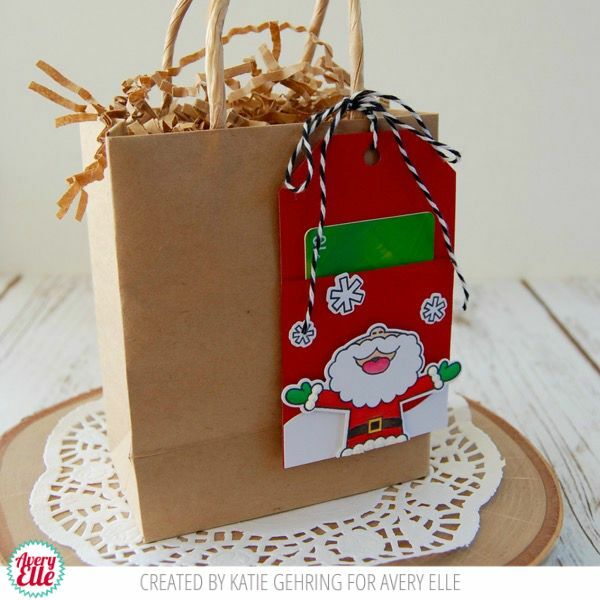 Katie used our Oh What Fun clear stamps and dies along with our Pocket Tag dies and Custom Panel dies to create this cute holiday tag. I love the combination of these sets. They look fantastic together! Thanks Katie and Karolyn for showing us these fabulous projects today! Thank YOU for stopping by to take a peek. Have a great weekend! Heather and JJ have some cute cards for us today! Heather used our Pick N Mix clear stamps, Sweet Scallops dies, Scalloped Banner dies and patterned paper from our Neutral Collection to create this first card. 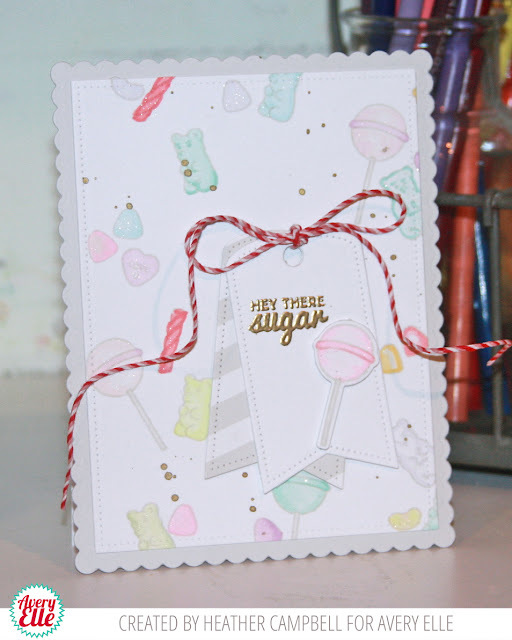 I love the way she stamped her own custom candy background! JJ used our Monsters clear stamps and dies along with our Double Pierced Circle dies and patterned paper from our Harvest Collection to create this next card. I just love that cute monster and the floating balloons! 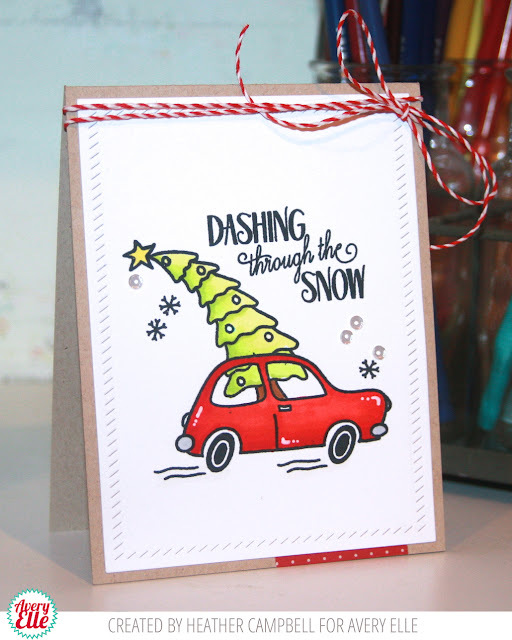 A Tag, Layout & Card! Hello! 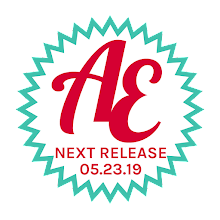 I have three fun projects to share with you today. 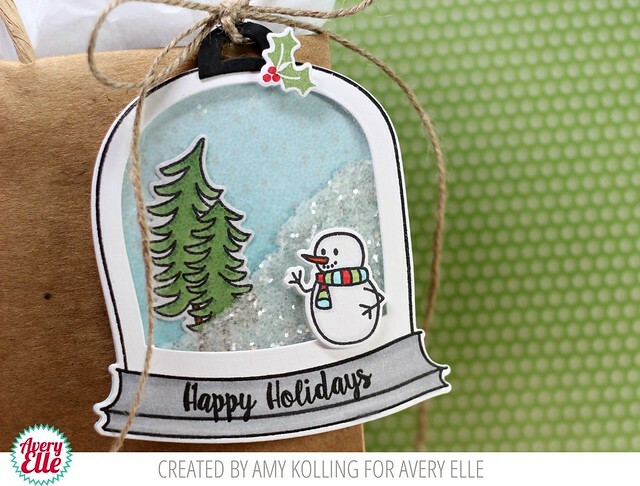 Amy used our Snow Globe clear stamps and dies , our Fa La La clear stamps and dies and our Silver Fox, Cherry, Jungle pigment ink pads to create this first tag. 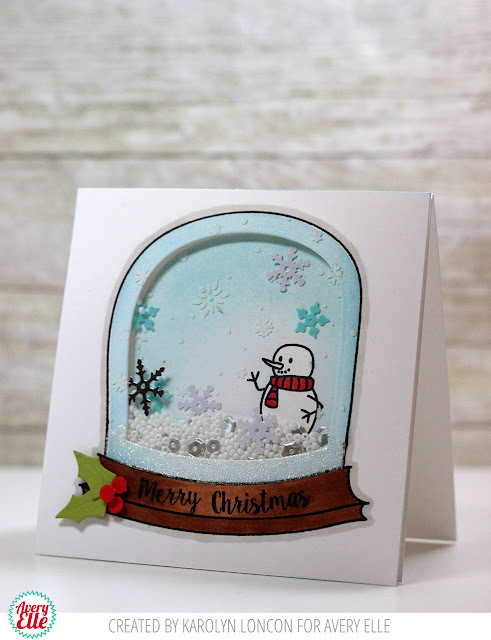 Amy shows how you can use the Snow Globe die to turn this cute snow globe into a shaker. I love that with the die you have the option to make a tag, shaker or just cut out the images themselves. This is so cute. I LOVE it! Check out these two "sweet" projects by Maska. She used our Avery's Alphas stamps and dies along with our new Pick N Mix clear stamps and dies to create this colorful layout. It is so happy and fun. I think it is so cute! 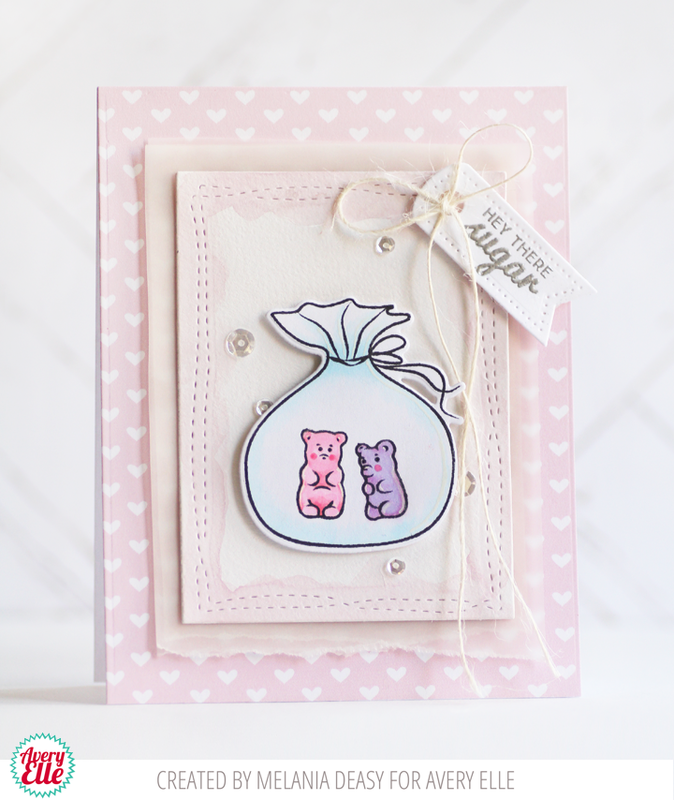 Maska used our Pick N Mix stamps and dies to create this next card. I love the way the gummy bears look lined up in a row!! Thanks Amy & Maska for sharing your great work with us today. Thank YOU for stopping by to take a peek. Have a great day! Melania has as a "sweet" card to share with us today. As always, Melania's coloring and shading is just gorgeous. I love the soft patterned paper background! Snow Caps, Polar Pals, Christmas Florals & More! Hello! I have three fantastic cards to share today. Caryn used our Polar Pals clear stamps and dies, our Snow Caps Dies and our Sweet Scallops dies to create this first card. I love the adorable polar bears, soft falling snow and the mountains in the background! 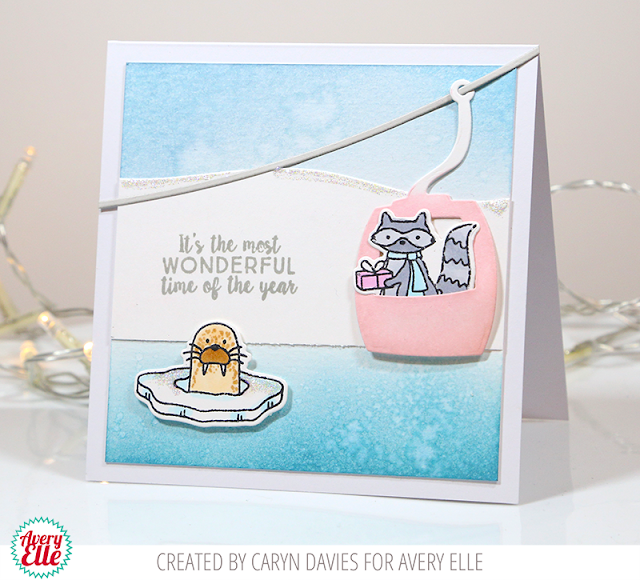 This next card by Caryn is SO fun. She used our Polar Pals and Snow Much Fun stamps and dies along with our Snow Caps dies. I love how she put one of our critters into the gondola. It is too too cute! 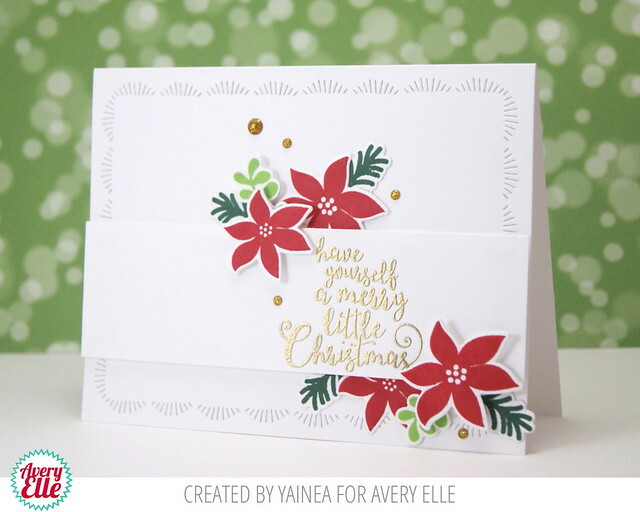 Yainea used our Christmas Florals clear stamps and dies along with our Scalloped Frames dies to create this last card. I love the way the red, green and gold really pop off of the white background. It is gorgeous! Hello and Happy Friday! I have some fantastic holiday cards to share with you today. 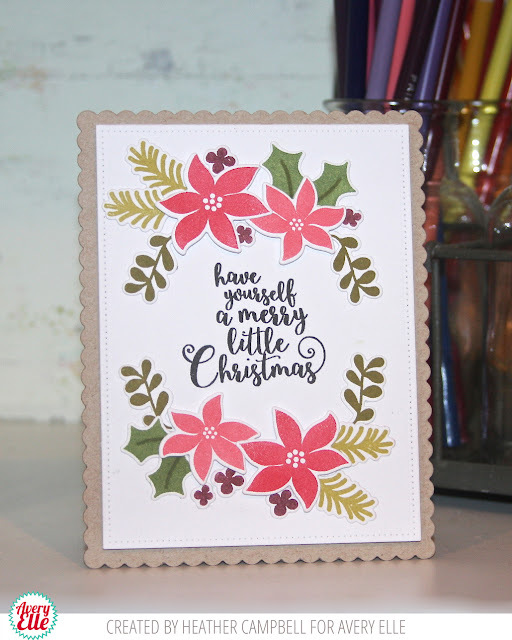 Katie used our Beautiful Bows clear stamps with our Cherry Pigment Ink and Lucky Collection A2 Notecard to create this first card. I love how this card looks wrapped up like a package! It is exactly what I had envisioned in my head while I was illustrating the set! Katie used our Snow Globe clear stamps, a Cherry Ink Pad, our Build A Banner clear stamp set and dies and patterned paper from our Jewel Collection paper pad to create this next card. I love the bright colors and the way Katie tied twine around the bottom of the snow globe. It is SO cute! 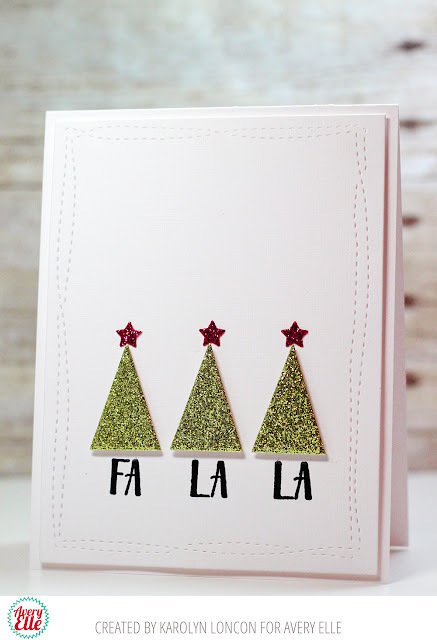 Karolyn used our Fa La La clear stamps, Snow Caps Elle-Ments dies, Sweet Scallops Elle-Ments dies, and Wonky Stitches Elle-Ments dies to create this next card. 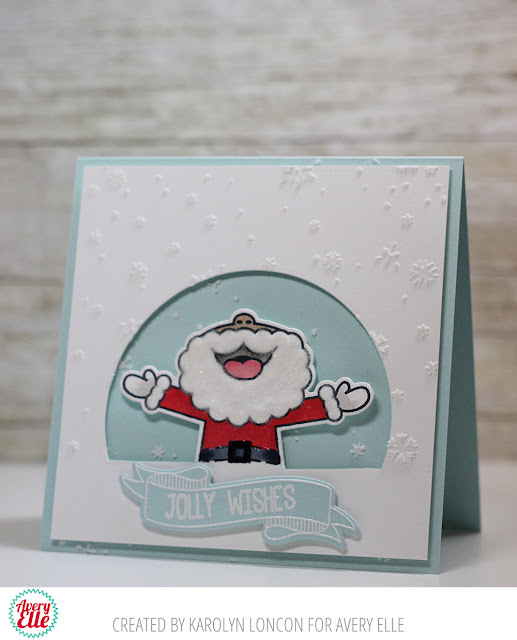 Karolyn shows how you can use the smaller dies included in our sets to create a totally new look! I love that the little trees are the star of the show!! Karolyn used our Snow Globe clear stamps and dies, Snow Caps Elle-Ments dies, Sweet Scallops Elle-Ments dies, Season's Greetings Elle-Ments dies, Double Pierced Rectangle Elle-Ments dies, and our Let It Snow Stamp Set to create this next card. I love the soft winter scene! Hello! I have some amazing inspiration from Heather and JJ to share with you today. Heather used our Sweet Scallops Dies along with our Christmas Florals clear stamps and dies and the banner from Fa La La to create this holiday photo greeting card. I love the idea of mass assembling a card like this for the holidays. It is so cute! 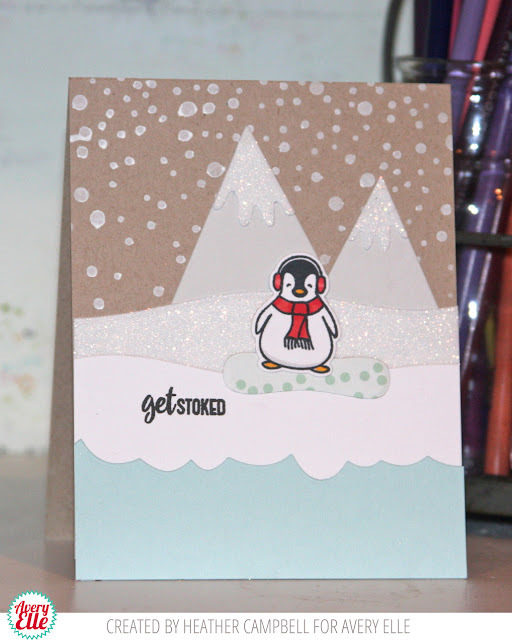 Heather used our Penguin Greetings clear stamps and dies, our Snow Caps dies, Swim Team dies and patterned paper from our Everyday Collection to create this next card. I love the falling snow, that snowboarding penguin and the fun sentiment! 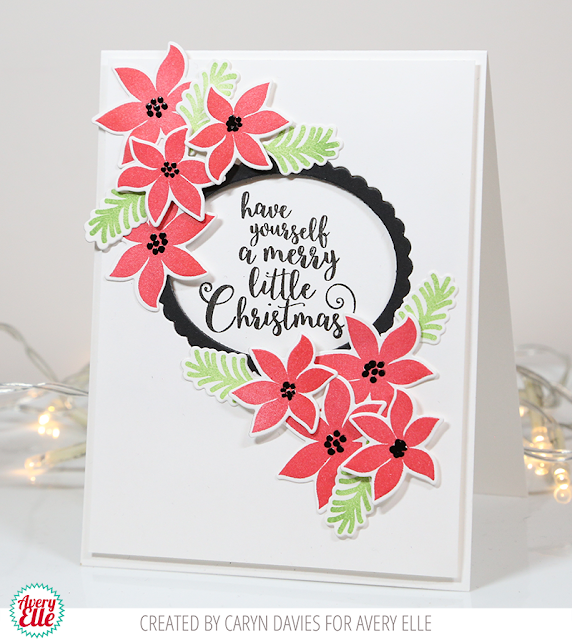 Heather used our Sweet Scallops dies and Christmas Florals stamps and dies to create this next card. I love the way she framed the gorgeous sentiment in flowers!! They really pop against the scalloped kraft card base. 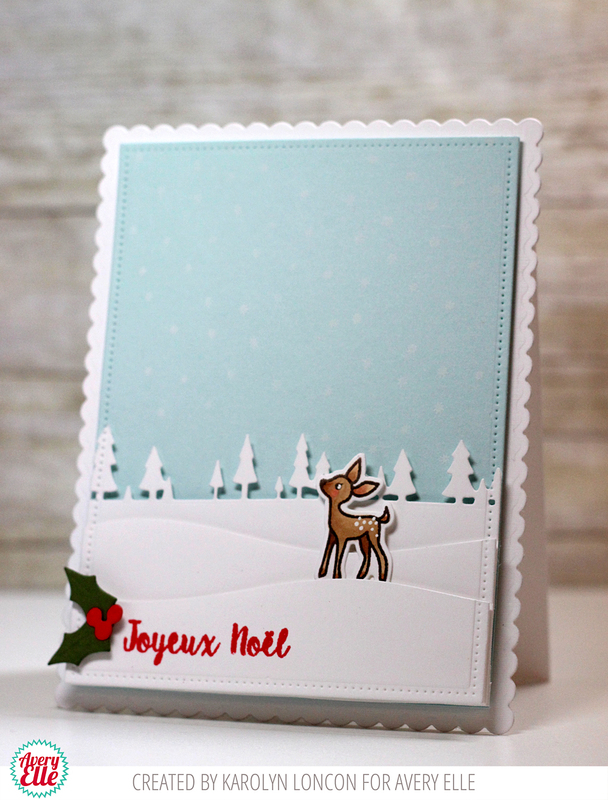 JJ used our Dashing and Fa La La stamps and die, Custom Panels die, Double Pierced Rectangle die, and patterned paper from our Jewel Collection to create this next card. I love the way she shaded a little bit of blue in behind the car. It is a small detail that makes a big impact! JJ used our Pick N Mix clear stamps and dies, Sweet Scallops die, and patterned paper from our Brights Collection to create this next card. I love how JJ cut out the inside of the treat bag and layered all of the yummy candy images inside. It is very clever and adds some great depth and detail to the card. 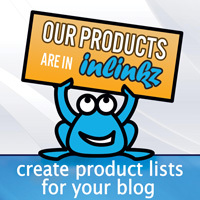 I also wanted to let you know that our friend Céline Navarro created a wonderful video showcasing some of our products. Be sure to check out her video below and blog post here . Thanks Heather and JJ for sharing your beautiful cards with us today. Thank YOU for stopping by to take a peek. Have a great day!